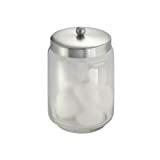 Product DescriptionApothecary jar suits to be another addition to your set of storage containers. Stack up your bath cabinet shelves or corner shelves with these glass jars that allow storing all kinds of bath supplies including make up accessories, cotton balls, first aid items etc. Apothecary jar gives a crystal clear view of stored contents. 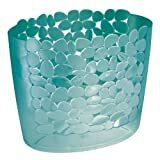 You can quickly identify the item you need from the clear storage jar. The apothecary jar has a wide brim for easy access of supplies. It is covered with a stylish stainless steel lid that gives it a classy appearance. Alternatively, fill in eatables like cookies, colorful candies and many other varieties, and place these glass apothecary jars set on kitchen table tops, cabinets etc. to make your kitchen look presentable and sophisticated. Product DescriptionManor Hill Shower Curtains are an elegant update to your bathroom. Easy care, sophisticated designs in rich colors will instantly update your bath.